In 1957, Zao Wou-Ki embarks on a one-year trip to New York, Japan and Hong Kong with Pierre and Colette Soulages. The formative trip is essential in Zao’s career as it projects the artist in the heart of the Post-War international art discourse, and acts as an initiatory journey in his artistic reflections; 29.01.64 (Lot 24), an undisputed masterpiece epitomizes the highest completion of the considerations triggered during the trip seven years before. Wold War II created a fracture in the international art world. In the aftermath of the War artists sought to exceed the formalist pre-war considerations in seeking to push the limits of the avant-garde painting in a more humanist approach. French art critic Michel Tapié, who contributed to the artistic exchanges with several trips to the United States and Japan, summarizes the movement with the designation “un art autre”, another kind of art. Therefore, an international artistic community forms to address questions around abstraction, its source and meaning. A group of Western artists, both in New York (Mark Tobey, Jackson Pollock, Franz Kline) and in Paris (Hans Hartung, Pierre Soulages, Georges Mathieu) looked into Chinese calligraphy art and the splashing of ink and paint. With a strong interest in abstract beauty, ambiguity, and mystery in calligraphy and abstract pictographs, they merged the Eastern spirit, as they viewed it, with the dynamics of abstract expressionism and the spontaneity of free handwriting, reconciling into abstraction the gestural movement and the artist’s interiority inherent to calligraphy. Zao’s discovery of disproportionally urban New York city and his first encounter with the Abstract Expressionist painters, Franz Kline, Philip Guston, Mark Rothko, Conrad Marca-Relli and Adolf Gottlieb, co-artists represented by the established Kootz Gallery in New York, at a time when the contemporary art hub (and political hegemony) was shifting from Paris to New York brings Zao a new breath, a freshness opening to new perspectives. With his large transversal black brushstrokes calligraphic-like paintings (Fig.1) Franz Kline encourages Zao to strongly structure the composition as one sees in 29.01.64 , with a monumentality that one cannot detect in Zao’s previous work. However, as Kline’s lines are somewhat strict and linear, Zao draws from his knowledge of a plurality of calligraphic styles and classical landscape painting to further complicate the underlying structure with small frenzied shifting lines, thus surpassing the American master with the recourse to his Chinese roots. From this period, the artist unbridles his brush to develop a bolder style and master bigger canvases. The action painting is in force in New York in the late 1950s. The performative gesture of painting imprints its movement onto the canvas, the process of painting acting as an essential part of the work and the composition being the brilliant result of the energy spent by the painter. The process inspired Zao Wou-Ki. One imagines his ample movements like a mesmerizing dance necessary to compose 29.01.64 , the swift gestures remaining in the essence of the large dark vertical structuring brushstrokes. 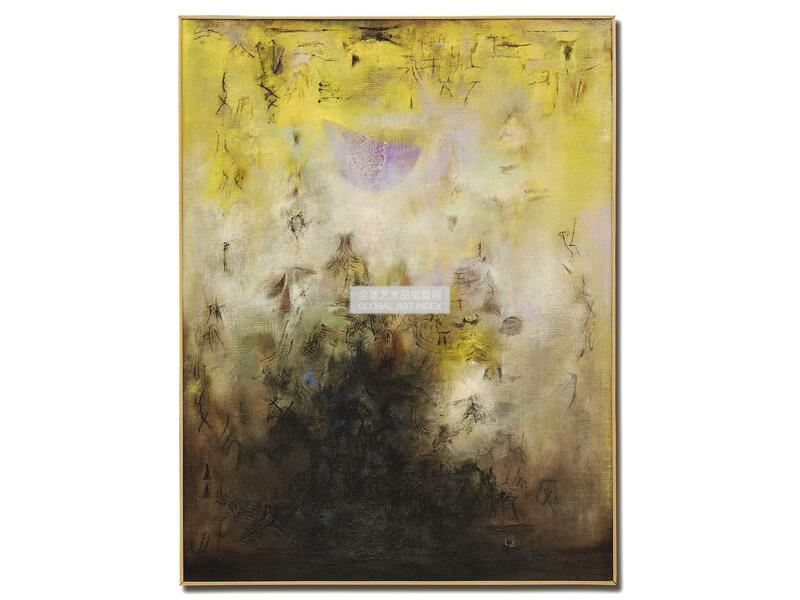 As well, Zao Wou-Ki owes to a discussion with Mark Rothko his new confidence with large canvases. About large paintings Jean Leymarie notices that Zao Wou-Ki “feels more at ease with the freshness of the movement and the freedom of improvisation on vast surfaces1 ” the artist explaining that “painting is a battle between (him) and the canvas, a physical battle. Specifically on large formats which allow more human movements, a true projection into the painting.” 29.01.64 represents a complex beautifully disrupted universe, the perfect example of Zao’s bodily battle with painting. More so than with smaller canvases the artist becomes one with the painting like the taoist human and earth unify in a perfect harmony. In contact with the American Expressionists Zao Wou-Ki acquires a sense of freedom to challenge tradition and an unfolding ambition assimilated through a working process and brilliantly emerging in his magnificent monumental 1960s compositions such as 29.01.64 . The next step of his 1957-1958 journey brought Zao to Japan where he met with the Bokujin-kai (ink society) group, cofounded in 1952 by five Kyoto-based calligraphers, namely Morita Shiryu and Inoue Yuishi, with the ambition to revolutionize the tradition of ink calligraphy by infusing a sense of gestural spontaneity and spiritual essence. When Zao arrives in Japan the Bokujinkai group had established since 1951 a vivid dialogue with the American Abstract expressionists through their Bokubi arts and literary journal. Artists from both sides of the world fuelled the same reflexion on gesture and spirituality by drawing from Asian artistic concepts and the Japanese calligraphic practice, developing the first truly international artistic exchange. 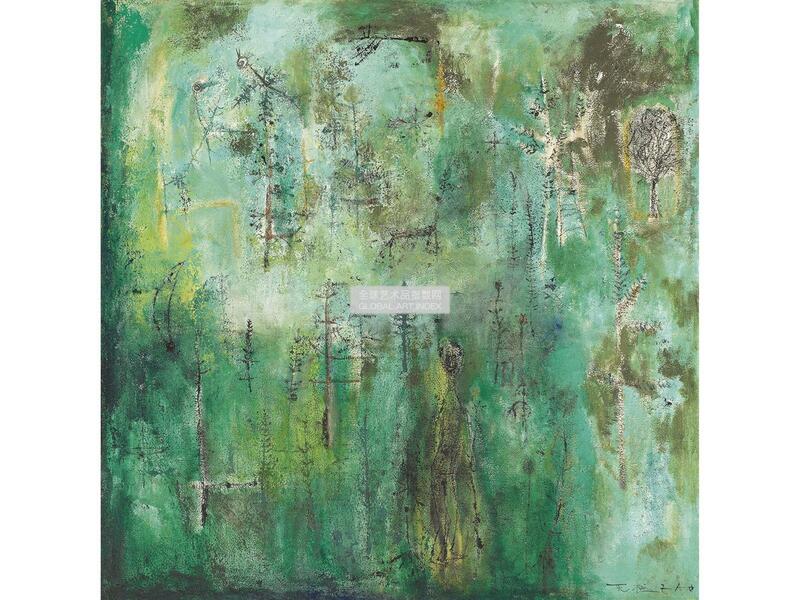 Established in France and coming from a Chinese educated background, Zao Wou- Ki naturally found a strong complicity with the thriving debate between New York and Tokyo. His experience in Japan triggers a more direct incorporation of calligraphy into his art. We understand that, by bridging the inside and outside, calligraphy is absolutely central in Zao’s painting as it allows the expression of the artist’s inner feelings in the manner of the Chinese literati painter, which along his career remains the artist’s admitted ultimate goal. Therefore, supplanting calligraphy while keeping its essence, abstraction becomes the artist’s own language. Started in 1957 until 1959, the oracle bone series show Zao’s first direct integration of calligraphy into his paintings with symbols evocative of the earliest known form of Chinese writing on bronze ancient vessels. Between 1959 and 1963 the oracle bone symbols dissolve into the background as the artist slowly succeeds in purifying the form while keeping the essence of the line. Starting with the Chinese character as an object of representation in the oracle bones series, Zao works his way to evict the sign and develop the plurality of the calligraphic forms into full abstraction. 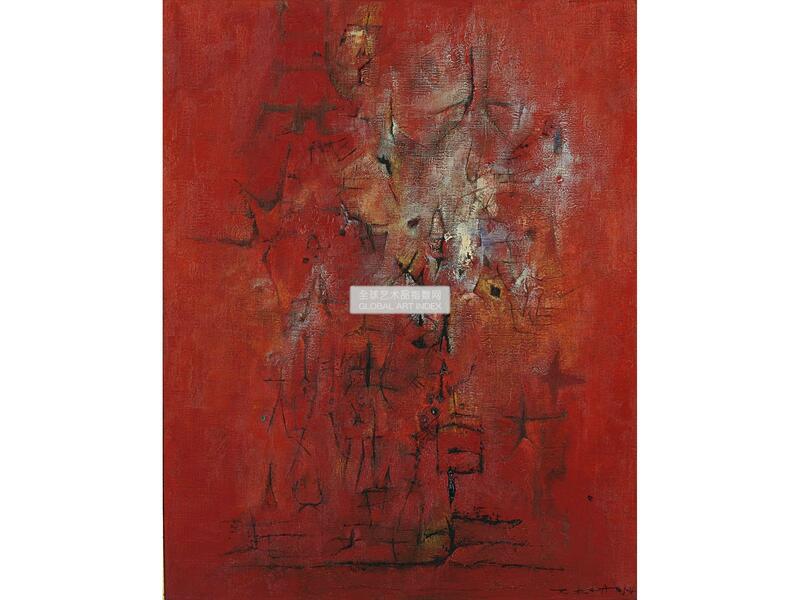 1964 comes as the peak of the artist’s achievement in his calligraphic influence. In 29.01.64 the large dark brown brushstrokes are reminiscent of the notorious Northern Wei style where one recognizes the strong structure while gracious feeling of the characters. On top of the bold structure, a network of intricate loosely painted lines with a sense of speed refers to the cursive script calligraphy, like the Tang dynasty Huai Su's Autobiography written in 777 AD (Fig. 4). Huai Su’s cursive writing, as one of the most artistically freely formed examples of Chinese calligraphy history, showing abandon and energy at once, offers the perfect bridge to understand Zao’s new concept of abstract calligraphy. The reduction of the palette to Shanshui-like colours as the sole mode of expression emphasizes the link to the calligraphy practice. In 1964, the same year as 29.01.64 was completed, Zao was quoted as saying « calligraphy is a gesture unfolding itself. 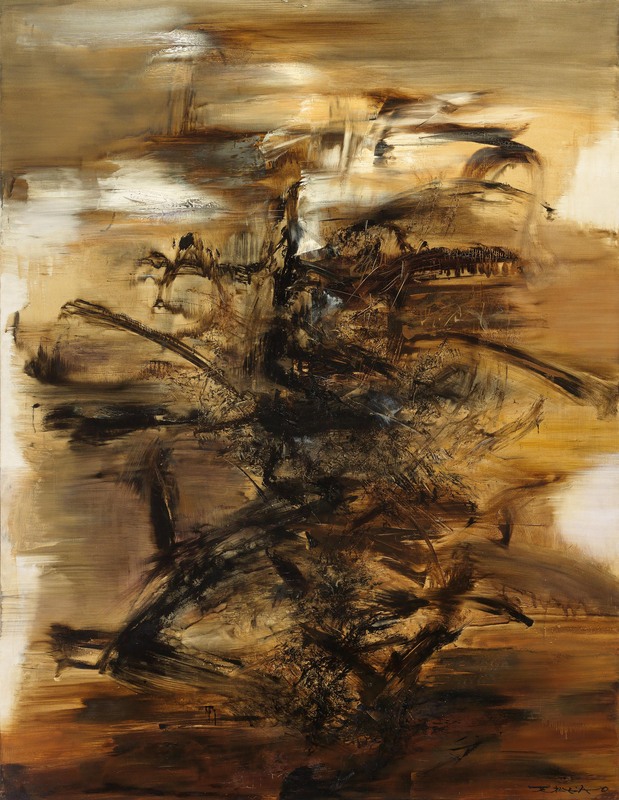 » By that time the artist had resolved the complicity between the gestural approach of the American Abstract Expressionists and the Asian movement of calligraphy contemporary renewal, which he is able to fully express into his work. Whereas the late 1950s show the start of the investigation, the 1960s epitomize the apex of Zao’s calligraphic influence in his oeuvre under various forms. However examples of important paintings where the calligraphic line is predominant in a full abstract language in such a clear way, as in 29.01.64 , are relatively rare. As Zao slowly turns away from this path in the later decades, the line becomes less obvious in his composition in favour of the background and a diversification of oil techniques resulting in stains and washes. In the West, the American artist Cy Twombly undergoes through a similar process in relation with writing. In what has been labelled the "blackboard" paintings (Fig. 5) by the end of the 1960s, the written language has been stripped of any legible content into scrawled lines transformed from abstract scribbles that once flew freely from the pulsating expansions and contractions of the artist's own lyrical gestures. The writing investigation in abstraction echoes Park Seo-Bo’s series ‘Ecritures’ in reference to the meditative calligraphic traditions of his native Korea. The artist carves a sequence of rhythmic, graphic lines tracing his pencil through a thick layer of still-wet paint, emphasizing the link between calligraphy and gesture in an almost mechanically manner (Fig. 6). Cy Twombly, in a rational approach, and Park Seo-Bo, through a meditative process, similarly tend to narrow down the expressive tools of colour and form to achieve the most autonomous rhythmic repetitions, which Pierre Restany refers to as « écriture automatique », automatic writing. Zao Wou- Ki goes in the opposite direction in a quest of plurality of expression to the recourse of the calligraphic richness, where the emphasize is put on the painted result rather than the process. With the successful development of an abstract calligraphic pictorial language Zao Wou-Ki belongs to an international narrative of the 20th Century where boundaries between continents and forms of art fall to the profit of convergence and interpenetration of artistic influences. The abstract art of Zao Wou-ki has deep roots in the great landscape painting tradition of China's Song and Yuan dynasties. The vertical composition of 29.01.64 resembles Guo Xi’s Early Spring (Fig. 7) grandeur of magnificent landscape punctuated with high mountains and trees. Using a wide range of ink techniques, Guo Xi focused his attention on the impact of changing seasons on the same natural scenery, thus leaving an important part of his composition to the ever-changing, the feeling and the intangible. While keeping the same monumentality in composition Zao pushes Guo’s revolutionary approach further by giving the full space and form to the feeling and the intangible with the recourse to the freedom of abstraction. One can still detect in 29.01.64 the outlines of natural elements, such as Jean Leymarie seeing ‘giant trees erected in a storm4’. From 1958 onwards Zao Wou-Ki starts to laconically title his paintings with their completion date, leaving to the viewer the interpretation of his own inner landscape. Richard Barnhart’s description of Guo Xi’s Early Spring could as well apply to the instinctive grandeur of Zao’s 29.01.64 : «Guo Xi’s most powerful extant work, Early Spring, dated 1072, is a vision of flux, growth, life and order precisely suited to the imperial gaze (…) building up of form to create this monument of the national landscape.” In 29.01.64 Zao Wou- Ki positions himself in continuity of the brilliant Chinese landscape tradition in expressing the invisible, at the core of the tradition, while renewing its form. Western painters stem from a tradition of representation where art acts to the service of a social, power or religious purpose. In the 19th Century with the Romantic then the Impressionist movements artists set free from this confinement and started to shift their focus towards their own subjectivity. The artist individuality is from then on at the centre of Western creation and art, detached from any utilitarian purpose, becomes an autonomous field of reflection. In China, artists rely a much longer tradition of expression since the development of literati painting in the 10th Century Northern Song period, where the object of painting is the subject. Expression as opposed to representation draws from the artist’s introspection, a long cultural history in China which matches the Western modern considerations, where artists sought a more humanistic approach. 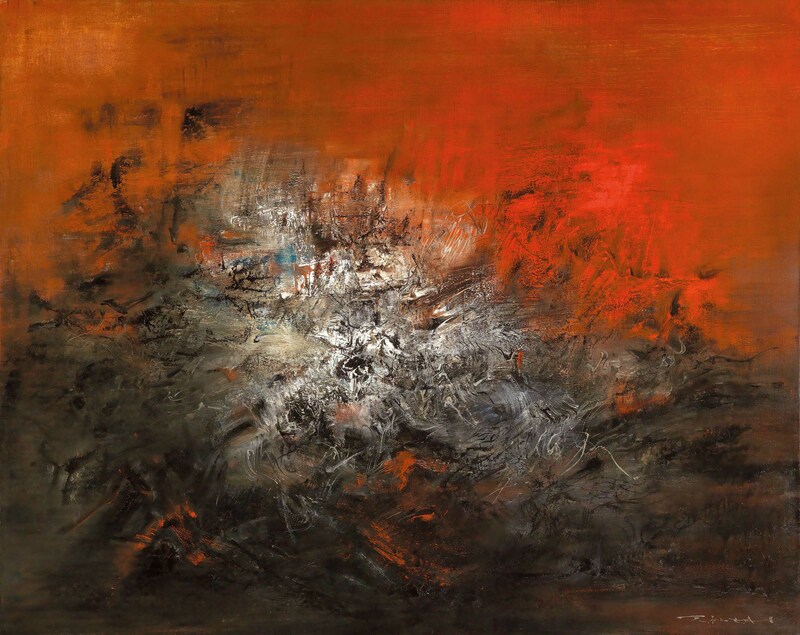 Adopting the position of a Chinese literati painter in a Western artistic style Zao Wou-Ki embodies the convergence of the Eastern tradition and Western modernism. 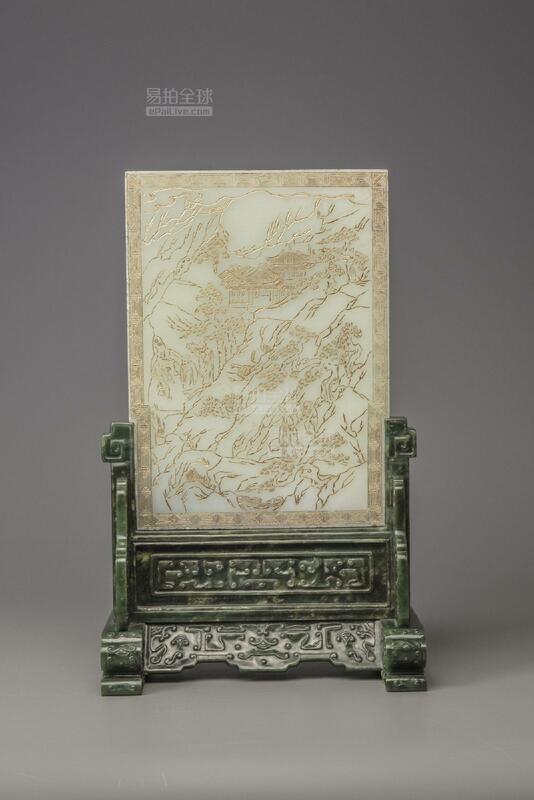 Traditional Chinese literati painting features a combination of poetry, calligraphy and painting, through the mutual penetration of texts and images, thereby creating a common aesthetic realm with what might otherwise be considered distinct artistic genres. The famous poet in the Song Dynasty Su Shi believed that poetry was the origin of calligraphy and painting. As his poem goes, 'What overflows and fails to be carried by the vessel of poetry alone, could find its outlet in calligraphy, which could transform itself into paintings.' Artistic expression flows freely between the pictorial representation, the calligraphic form and the characters’ inherent meaning. By incorporating calligraphic lines into his abstract compositions and drawing from the landscape practice inspired by the artist’s inner self, Zao Wou-Ki is able to summarize the complementarity of calligraphy and painting in a revolutionizing way. As well 24.01.64 holds a comparison with the Western tradition in the representation of space. The large sweeping dark brushstrokes stand out against an ochre brownish background, contrasted with several white areas. The opposition between dark browns and white parts creates depth and three-dimensionality in a dramatic effect in the manner of the Chiaroscuro, an oil painting technique developed in the Renaissance (Fig. 8). Zao Wou-Ki translates a classical Western technique of rendering reality into the realm of abstraction, generating an imagined space. With his disturbing disrupted landscapes deeply imbued with the artist’s emotions, William Turner appears as the pioneer of a subjective abstraction (Fig. 9). While his painting remains figurative using representational titles the composition sets free from reality, thus opening a new artistic path to the development of abstraction in the West. Interestingly Turner’s landscapes imply a similar approach as the Chinese landscape painting (Fig. 10), where the parts left white from the virgin paper are filled with energy and underlying meaning. As Chinese painting restrict the palette to black and white, Turner resorts to colours to add elements such as light and depth which can only be implicit in Chinese landscape painting. While keeping ties with the original landscape Zao Wou-Ki reconciles Turner and Chinese painting into radical abstraction infused with a universal spirituality. Created half a century ago, this masterpiece stood the test of time and continue to captivate. At a time when the wave of globalization is everywhere and art historian today challenge the preconceived notion of Western dominance, 29.01.64 take us back through centuries old civilizations so that we can reorient ourselves both to our present and to our pasts. 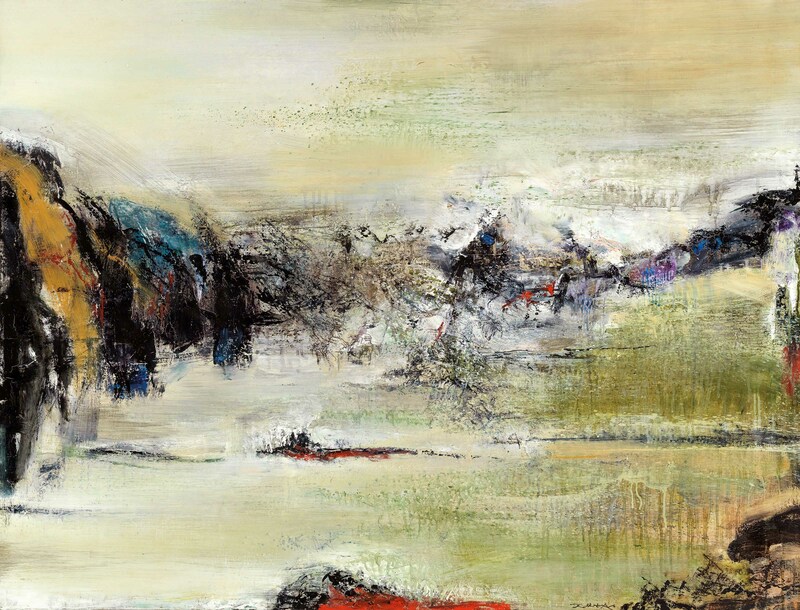 Zao Wou- Ki has brought to life the mutual challenge and integration of the two ancient civilizations of China and the West, caught between inheritance and reinvention. 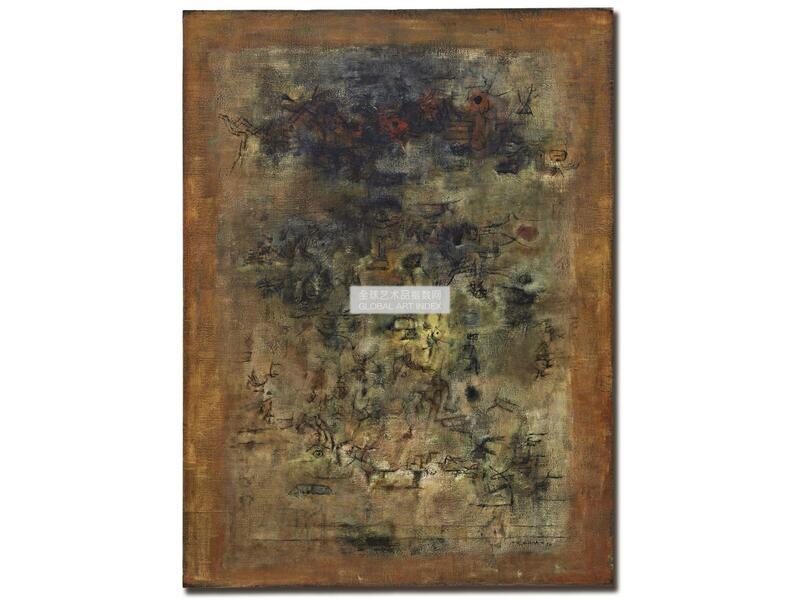 This work is accompanied by a certificate of authenticity issued by the Foundation Zao Wou-Ki. prepared by Francoise Marquet and Yann Hendgen (Information provided by Foundation Zao Wou-Ki). This lot has been selected by the Musée d'Art Moderne de la Ville de Paris for its exhibition tentatively planned to be held between June 2018 to January 2019. Therefore, the buyer of this lot shall agree to exhibit this lot in the Musée d'Art Moderne for the duration of the above exhibition. For more details, please contact the department. Jean Laude, Zao Wou-Ki, La Connaissance s.a., Brussels, Belgium, 1974 (illustrated, p. 51). Jean Leymarie, Zao Wou-Ki , Documentation by Françoise Marquet, Editions Cercle d’Art, Paris, France and Ediciones Polígrafa, Barcelona, Spain, 1978 (illustrated, plate 110, p. 159). Daniel Abadie & Martine Contensou, Zao Wou-Ki, Edition Ars Mundi, Spain, 1988 (illustrated, plate 26, unpaged). 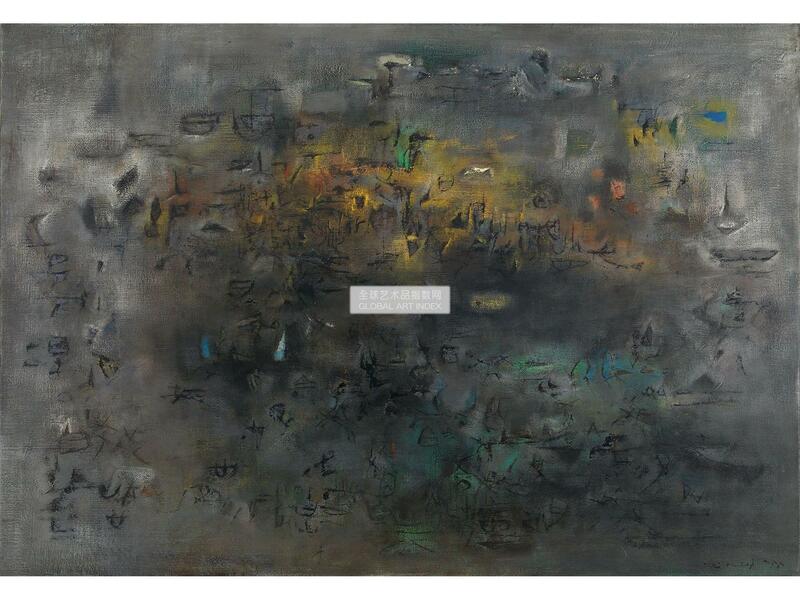 Artcurial, Zao Wou-Ki 1955-1988 (exh. cat. ), Paris, France, 1988 (illustrated in black & white, p. 15). 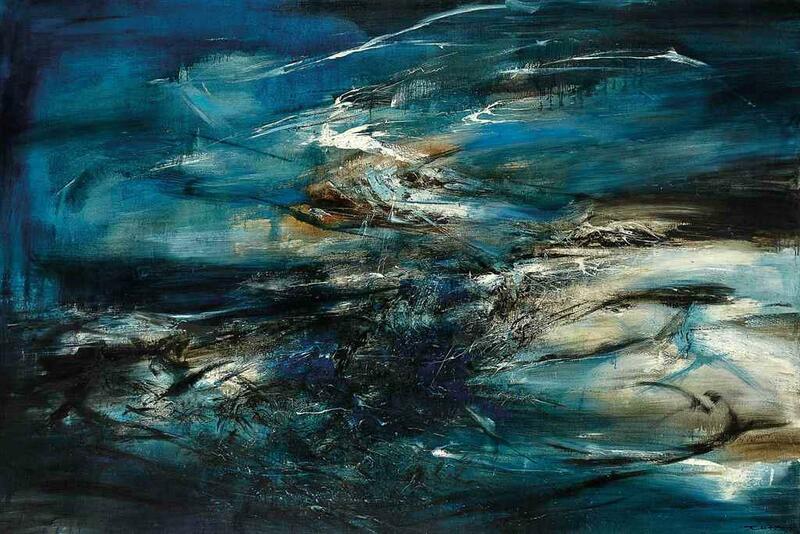 Pan Tai-Fang & Chen Shu-Ling, Zao Wou-Ki Retrospective (exh. cat. ), Taipei Fine Arts Museum, Taipei, Taiwan, 1993 (illustrated, p. 54). 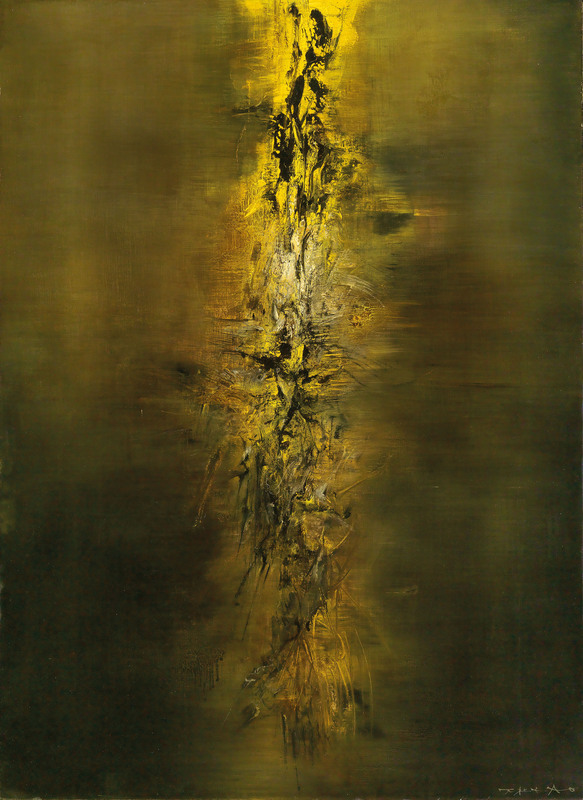 Hong Kong Museum of Art, Infinite Image and Space – A Retrospective of Zao Wou-Ki (exh. cat), Hong Kong, 1996 (illustrated, p. 105). Bernard Noël, Zao Wou-Ki Grands formats - Au Bord du Visible, Editions Cercle d’Art, Paris, France, 2000 (illustrated, plate 8, unpaged). 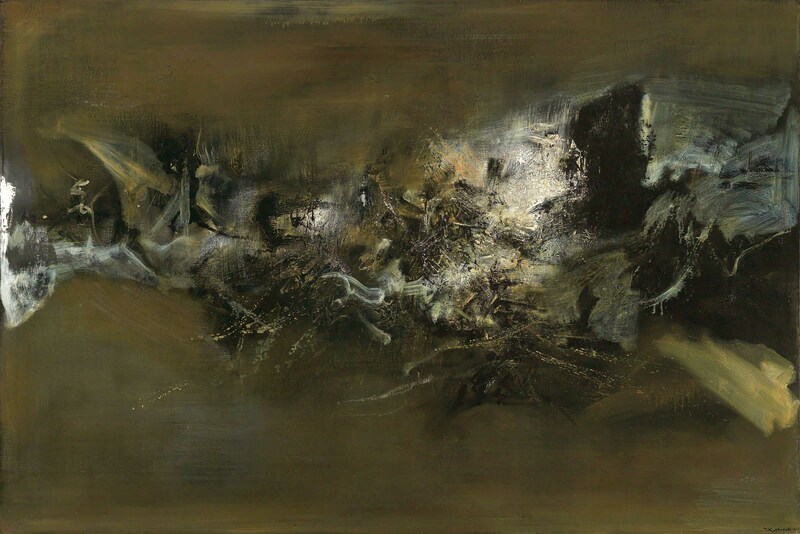 Palais Bénédictine, Zao Wou-Ki : Paysages Intérieurs, 1947-2004, (exh. cat. ), Fécamp, France, 2005 (illustrated, p. 21). Dominique de Villepin, Zao Wou-Ki - Oeuvres 1935- 2008, Flammarion, Paris, France, 2009 (illustrated, p. 155). Pittsburgh, USA, Museum of Art, Carnegie Institute, International Exhibition of Contemporary Painting and Sculpture, 1964. Paris, France, Galerie de France, Zao Wou-Ki OEuvres récentes, 1967. Beverly Hills, USA, Frank Perls Gallery, Zao Wou-Ki, 1968. Montréal, Canada, Musée d’art Contemporain / Québec, Canada, Musée du Québec, Zao Wou-Ki, 1969. Charleroi, Belgium, Palais des Beaux-Arts, Zao Wou-Ki, 1980. Montauban, France, Musée Ingres, Zao Wou-Ki ou se libérer du connu, 1983. Paris, France, Artcurial, Zao Wou-Ki 1955-1988, 1988. Lisbon, Portugal, Fondation Gulbenkian, Zao Wou-Ki, Oils and Watercolours, 1992. Arras, France, Noroit-Arras, Zao Wou-Ki Retrospective: Paintings 1955-1952, 1993. Taipei, Taiwan, Taipei Fine Arts Museum, Zao Wou-Ki Retrospective, 1993. Nevers, France, Maison de la Culture, Zao Wou-Ki Peintures, 1995. Kaohsiung, Taiwan, Kaohsiung Museum of Fine Arts, A Retrospective of Zao Wou-Ki, 1996. 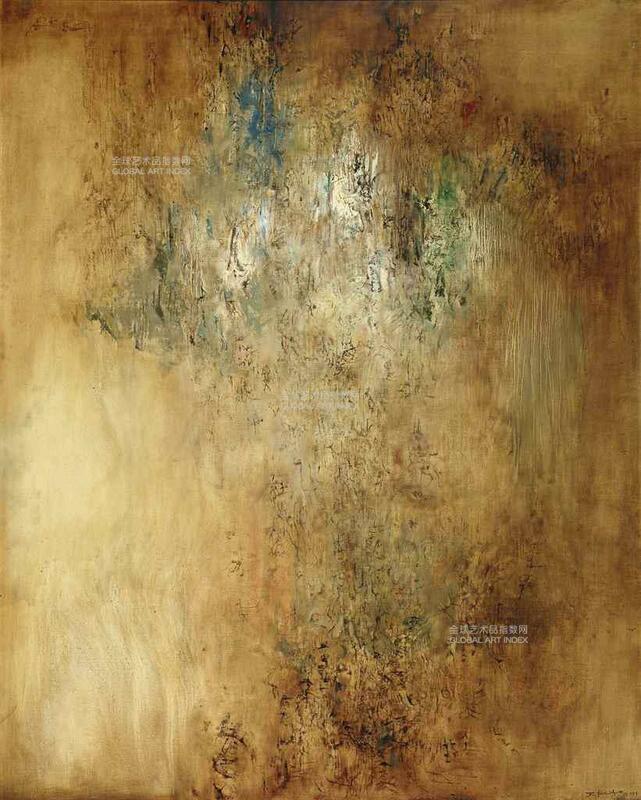 Hong Kong, Hong Kong Museum of Arts, Infinite Image and Space - A Retrospective of Zao Wou-Ki, 1996. Fécamp, France, Palais Bénédictine, Zao Wou-Ki : Paysages Intérieurs, 1947-2004, 2005.